Dive and Sea Tenerife are situated in Golf Del Sur in the south of Tenerife, Canary Islands. Our PADI Dive Centre has been awarded the prestigious 5 Star Instructor Development Centre rating from PADI, which amongst other criteria, rewards Dive Centres that excel at customer service, promote environmental awareness, exceed standards of other dive centres and committed to Diver education, satisfaction and safety. 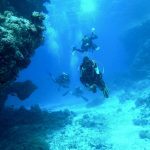 With the PADI 5 Star IDC rating we are able to look after all your training requirements from your first ever try at diving, PADI Discover Scuba Diving, all the way through the full range of Professional courses. We cater for all levels of diver whether this is your first diving experience, continuing your dive education or simply you just enjoy diving we are the dive team for you.